The Massachusetts Alcohol and Substance Abuse Center in Plymouth looks more like a prison than an addiction treatment center. Ten men who have been ordered into treatment for addiction filed suit Thursday against several state agencies, alleging that they are unlawfully being held in a prison instead of a treatment facility. The plaintiffs are among the roughly 3,000 men each year who have not been charged with a crime but are civilly committed for addiction treatment in Massachusetts. The majority of these men go to a prison in Plymouth, where they are surrounded by razor wire and monitored by correctional officials. According to the suit, filed as a class action, the men wear prison clothes with badges labeling them “inmates,” face routine insults and humiliation from correctional officers, contend with filthy conditions and inadequate food, are subjected to strip searches, and even endure days of solitary confinement. Amid all this, the suit says, they receive “minimal” help with their addiction, with about five times more correctional officers than counselors on staff. 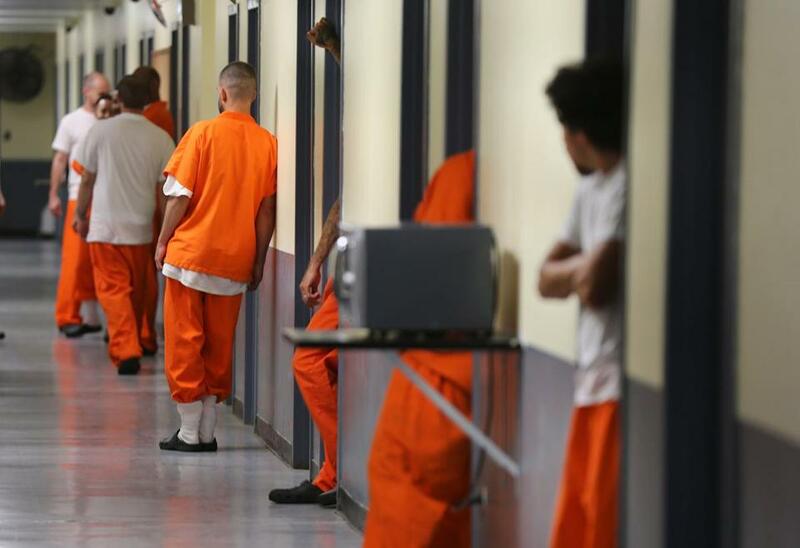 “Many, if not most, emerge from prison traumatized by the experience and even more vulnerable to relapse and overdose,” according to the suit, which was filed in Suffolk Superior Court by the advocacy group Prisoners’ Legal Services of Massachusetts. “In a civilized society, no one should be sent to prison for a disease,” said James R. Pingeon, the group’s litigation director. About a third of the men have alcoholism and the rest suffer from opioid or other substance use disorders. The suit challenges the way the state handles the law known as Section 35, which enables a family member or law enforcement official to ask a judge to civilly commit a person to addiction treatment. If the judge finds the person has an alcohol or substance use disorder likely to cause serious harm, the court may order the person committed for up to 90 days. All women and a quarter of the men so committed are sent to treatment programs. But most men end up at the 251-bed Massachusetts Alcohol and Substance Abuse Center, located at a prison deep within the Myles Standish State Forest. The suit alleges that this policy constitutes gender discrimination, violates the Americans with Disabilities Act, and violates the constitutional right to due process. It asks the court to prohibit the state from sending civilly committed men to a correctional facility. The suit names as defendants the Department of Correction and the Department of Public Health, and the leaders of those departments, including Thomas Turco, secretary of public safety and security, and Marylou Sudders, secretary of health and human services. Spokespeople for all the defendants declined to comment Thursday, saying they do not comment on pending legislation. Many states have laws allowing civil commitment for addiction treatment, but Massachusetts is unique in sending civilly committed people into the care of the Department of Correction. Massachusetts also uses civil commitments much more commonly than any other state, said Leo Beletsky, a Northeastern University law and health sciences professor. Getting a loved one “sectioned” is a fast and simple way for parents to access care for free, and many can find no other options, he said. But “coerced treatment is definitely no better and likely less effective” than voluntary treatment, Beletsky said. And putting people in a prison environment can be traumatizing, worsening their addiction, he said. Pingeon said many parents don’t even know that their children could end up taken in shackles to a prison. “Imagine trying to get help for a child in a desperate struggle with substance use, and that the treatment facility you thought you were sending them to turns out to be a prison instead. It’s a parent’s nightmare,” he said. The mother of one of the plaintiffs said she has faced just such a nightmare. Her 23-year-old son, who suffers from bipolar disorder and anxiety, recently became addicted to marijuana. He began stealing from the family and damaging property. On the recommendation of a police officer and court psychologist, she petitioned to have him committed two weeks ago. The mother, who didn’t want to be identified for fear her son would suffer retaliation, didn’t hear from him for the first five days. When her son finally called, he told her that he’d had a panic attack when he arrived at the Plymouth facility and was placed in solitary confinement for five days without his medications. He received no treatment for a week and a half, she said, and was finally allowed to attend a group after his mother called. She said he sees a counselor just for a few minutes now and then. Being at the Plymouth facility has “definitely raised his anxiety a lot and his panic attacks . . . he’s still not getting the treatment he needs,” she said. ■ A patient with opioid use disorder received only Motrin for his “excruciating” withdrawal pains. ■ A 29-year-old committed for alcohol use had worked two jobs. He is afraid to call his employers because a call or letter from the facility automatically identifies him as a prisoner, and he doesn’t know if he’ll be employed when he gets out. A lawsuit prompted the state in 2016 to relocate civilly committed women from a prison to a hospital, but a similar effort was never undertaken for men. A proposal to close the men’s Section 35 facility in 2009 met with stiff opposition and was abandoned. A bill before the Legislature would require the state to send all men committed under Section 35 to bona fide treatment facilities licensed by the Department of Public Health or the Department of Mental Health.